FEW STREETS HAVE experienced as high a turnover as Camden Street. Countless shops, eateries, pubs and nightclubs have all come and gone over the years. Throughout this period of constant flux, one pub has managed to stand the test of time: Devitt’s. Standing on the corner of Pleasants Street and Camden Street, this city centre pub has been a fixture in the area since 1871 when the premises obtained its first license. Over the ensuing decades, the pub passed through the hands of many publicans and endured several highs and lows. In 1977, Limerick native and Dublin hurler Willie Devitt purchased the pub. The pub remained with the Devitt family until 2016 when publicans Paul and Eoghan Mangan took over. “It was our dream to be on Camden Street,” says Paul Mangan. Over the last few years, several high-profile bars and restaurants have opened on Camden Street and helped transform it into arguably the city’s top street for nightlife. “It’s the Irish people’s Temple Bar,” he says, pointing to the variety of pubs, bars and restaurants on the street. There’s a great range of options on the street, which I think is important. Most people going out now want to have options. There’s not many people who stay in the one pub for the entire night. They like to bounce between a few so I think Camden Street is ticking all the boxes at this moment in one time. Bars like The Jar, Huck’s, Jimmy Rabbitte’s, Camden Exchange and Camden Bites & Brews have all opened on the street in recent years. Devitt’s is one of just a handful of what could be classified as traditional Irish pubs left on the street. “Us and Cassidy’s would be the main two traditional pubs,” says Mangan, pointing also to The Bleeding Horse and Ryan’s. Upon taking over the pub, the Mangans gave it a minor facelift. They retained the original counter, wooden doors, panelling and other details, but “jazzed up” other parts of the pub. For instance, they erected a display containing over 300 different spirits. “It’s one of the biggest in a pub in Ireland,” says Mangan. But while they may have a vast offering of gins, whiskeys and craft beers, a pint of plain is still their bestseller. As for who frequents the pub, Mangan says it’s everyone from the office crowd to overseas visitors looking for a slice of authentic Dublin. “There’s a lovely mix between tourists, locals who have been in the area for a long time… it’s an all round offering for everyone,” he says. Elsewhere, the pub is well known for its connection to Irish sport. “We’d have a massive connection with the GAA,” says Mangan. Previous owner Willie Devitt played with Faughs GAA in Templeogue while the Mangans are hugely involved with rivals St Jude’s. The pub sponsors the likes of Ranelagh Gaels, Ballyboden St Enda’s and Portobello St. Kevin’s. Dublin hurler Danny Sutcliffe even gave the pub his 2013 All Star award. It currently has pride of place behind the bar. It’s also often frequented by players celebrating great victories. Aside from sport, the pub is well known for hosting music seven nights a week. That includes everything from traditional sessions to modern music. “It’s different acts every night, but the same lineup every week,” says Mangan. Among the regular musicians? Dublin footballer Kevin McManamon. The footballer plays with his band The Solids every Sunday. As with a lot of things in Devitt’s, everything comes back to the GAA. Email “'We have a massive connection with the GAA': How Devitt's keeps Camden Street old school”. 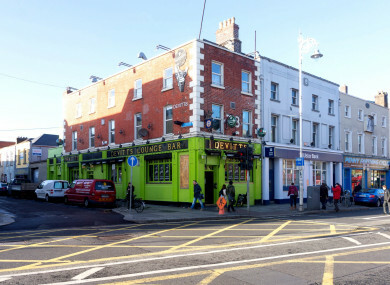 Feedback on “'We have a massive connection with the GAA': How Devitt's keeps Camden Street old school”.